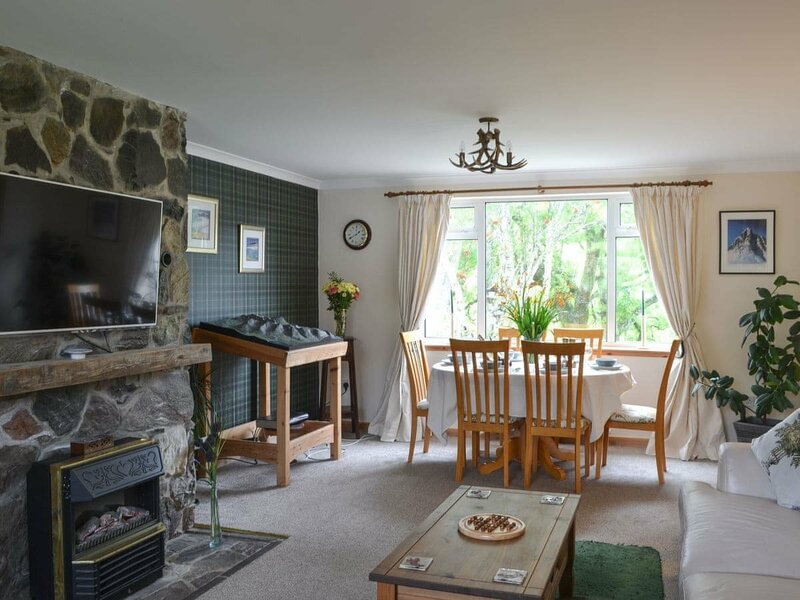 Cala Sona enjoys a peaceful setting within the scattered crofting community of Portnalong, towards the northern end of the beautiful Isle of Skye. The semi-detached dormer bungalow has been equipped and furnished to a good standard to ensure as comfortable and relaxing holiday as possible. Cala Sona is near the impressive Cuillin mountain range, the spiritual homeland of the island, and is just a short drive from the Talisker Distillery, the only one on Skye. Here you can take the tasting tour and sample one of the finest single malts produced in Scotland. Talisker Bay, Glenbrittle beach and the Fairy Pools will all be of interest to visitors to the island. Take a trip to Dunvegan, where you can visit the historic Dunvegan Castle and its gardens and then take the lovely walk to the coral beaches, a superb walk with the gem at the end of it! Take a short trip to the Waternish and Trotternish Peninsulas, which are both well worth a visit, and where the scenery is breathtaking with rugged coastlines, unspoilt rocky inlets and beaches. Portree, on the east side of the island, is the bustling main town where you can take a stroll down to the colourful harbour area and watch the fishing vessels unload their catch of the day. You can also take a sea trip from Portree to see the large variety of sea and bird life that the island has to offer. To the south of the island is Broadford, with the southern tip called ‘The Garden of Skye’, where you can visit the ruins of Armadale Castle and its lovely gardens. Skye is an outdoor enthusiasts’ paradise with many outdoor pursuits available, including sea trips, walking and climbing for all levels, kayaking, canoeing, mountain biking and fishing. For photographers, the island offers fabulous opportunities to capture the wildlife and dramatic scenery with its ever-changing light. For the less energetic, there is a large selection of art galleries, craft shops and some lovely restaurants to experience whilst on holiday. The island has so much to offer for all ages, and many happy memories will be made whilst there. Shop 3 miles, pub and restaurant ¼ mile. Be the first one to tell us about your rental experience while staying at Cala Sona. Let us know if the listing matched your expectations. You can share your comments about the location, property owner/manager and all the unique features that made your stay a memorable one.